Genetics in old samples: Fish scales and SNP chips. 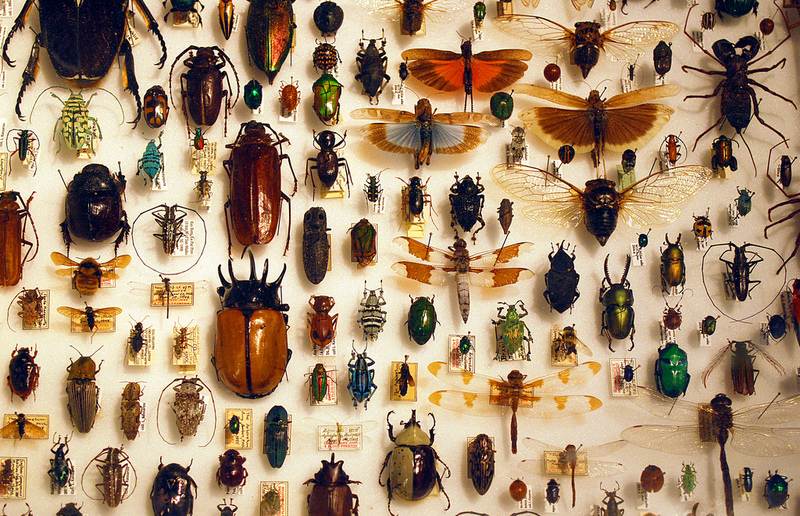 Biologists are natural collectors. As kids, we jam flowers into heavy books, trap poor bugs in new home-made homes, and curate elaborate collections of sea-shells. As adults, we understand the real purpose of collecting – educating, informing and fascinating. The impact of interbreeding with non-native individuals. However, such studies in historical samples have had a reputation for being problematic and unreliable, and for good reason. Over long periods of time, DNA starts to degrade and fragment into smaller pieces, making it harder to screen genetic markers in older samples. In addition, old samples are more open to contamination with related DNA, making the results less reliable. Fortunately, new genotyping technologies can examine single nucleotide polymorphisms (genetic markers known as SNPs) in much smaller fragments of DNA. But how reliable are these results? Can we really use old samples for cutting edge genetic studies? During my time with the Primmer Group at the University of Turku, I was interested in understanding the evolution of a number of life-history traits in Atlantic salmon in the Teno river system in Northern Finland. But, getting up to such a remote place and collecting enough salmon fitting our study design was just not possible. Instead, we decided to use a pre-existing resource – a huge collection of thousands of phenotypic measurements and scale samples by the fishermen on Teno river over the last 40 years, curated by the Finnish Game and Fisheries Research Institute in Utsjoki. 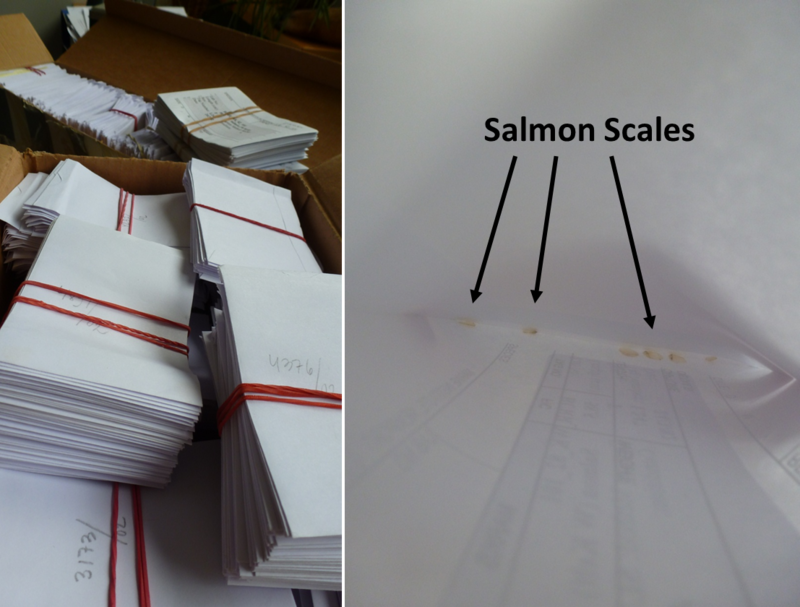 Paper envelopes containing salmon scales for our genetic study. Image: Susan Johnston. We were excited by the prospect of using new SNP technology in our old fish scales. Initial pilot genotyping looked very promising, but there was the still the worry that somehow, our results could be seen as unreliable. Therefore, we decided to put this idea to rest by formally testing how efficient and repeatable SNP genotyping was. We set about examining the DNA concentration and fragment sizes in scale samples collected over a 31 year period, repeating DNA extractions and genotyping runs multiple times within the same individual. We found that although DNA concentration didn’t change over time, DNA was much more fragmented in older samples. Despite this, the genotyping method we used (an Illumina iSelect SNP array) gave us more than 97% genotyping success and and error rate of < 0.2% when scanning more than 4,000 SNP markers in samples up to 35 years old. We were also interested to see if mixing DNA samples together could give us accurate estimates of allele frequencies. This is because SNP genotyping isn’t cheap – typing many individuals will soon add up to a high cost. However, if a genetic study only needs information on allele frequency, a genetic study could be theoretically be carried out using a handful of mixed DNA samples, rather than hundreds of individual DNA samples. We found that so long as we typed at least 30 individual samples to create a genotyping reference panel, mixed DNA samples gave highly repeatable allele frequency estimates (> 98.6% similar) and were highly correlated with the real allele frequencies within the pooled samples (99% similar). 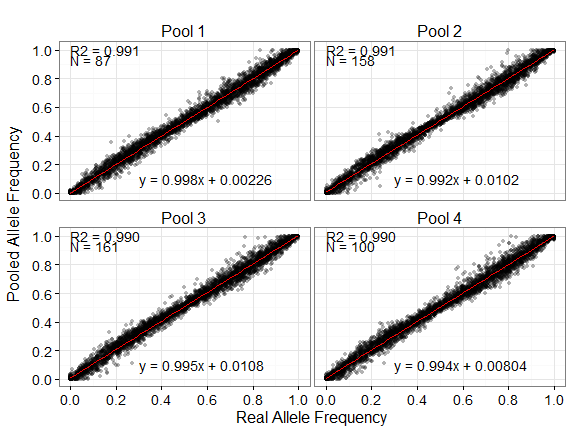 Correlation between pooled allele frequencies and real allele frequencies within each pool. Pooled allele frequencies shown here were calculated from nine replicates within each pool. R2 is the adjusted R2 values from a linear regression. N is the number of individuals included in each pool. Overall, our findings gave us confidence that more detailed genetic studies are now much more achievable in old DNA samples as a result of SNP genotyping technologies. 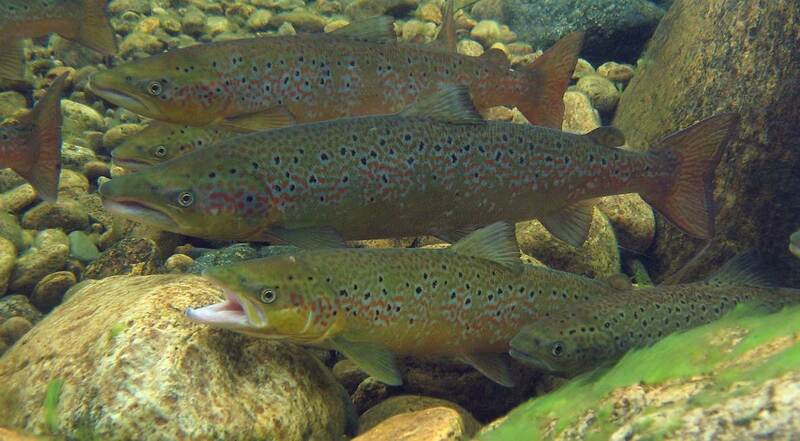 This is not just in Atlantic salmon – these methods are applicable to many different species. We have published our findings and conclusions in the journal BMC Genomics, along with detailed methods, results and recommendations for future studies.